Freezing conditions over winter have sent Terrain Aeration back to Sittingbourne and Milton Regis Golf Club in Kent to rectify a pan layer caused by perma frost on nine of the 18 greens. Head Greenkeeper David Horne who was one of the first turf managers to use the terralift machine when it arrived in the country in 1987 says that the frost affecting his older clay lined push-up greens was a bout 7 to 8 inches below the surface. "Once the thaw starts the surface softens but if you insert an 8 inch screwdriver into the turf it hits a frosted pan which isn't going to let water permeate through. You've got to find something that will get through it." 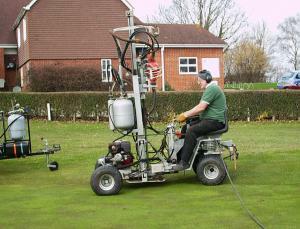 David, like greenkeepers all over the country has had his spring maintenance programme put back because of the weather. "We're all in the same boat, it can't be helped and we've just got to get on with it," he continues. "A company like Terrain Aeration is a big help. No body else has the terralift equipment or the experience in using it." This is the third or fourth time that the terralift machine has performed de-compaction treatment at Sittingbourne. On the first visit all 18 greens were traditional, clay lined push-ups and the machine was used to de-compact one metre below the surface, piercing through the clay lining and inserting compressed air to create fractures and fissures rising all the way to the surface. Since then a motorway has been built on part of the old course, the club has purchased 30 acres of adjacent farm land and nine new greens have been constructed to USGA spec. Terrain Aeration have relieved compaction on the nine older greens, as and when David Horne has deemed it necessary.